A raven croaks overhead as the mist descends onto Broad Street. 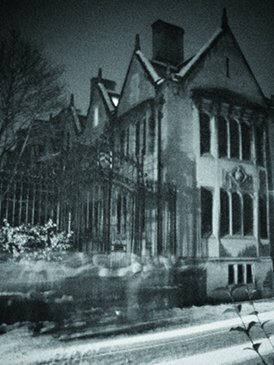 In front of Trinity is the eerie sign: ‘Hear spine-chilling stories from Oxford’s past’. The spectre-like figure of our guide beckons his bony finger towards me. 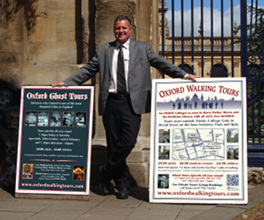 The Oxford Ghost Tour begins at 8pm, allowing us to appreciate the city in the eerie light of sunset. It was a hazy night, adding further gloom to the shadowy surroundings, although our guide soon put that to rest. “Hi, I’m Stuart,” he beams. “Just remember that name, as last week one tourist thought my name was geede!” He points at his GUIDE badge. The horror of the ghost tour had begun. Our 20-man troop consists of, among others, a couple from Canada, some ladies from York and Chester and, surprisingly, a lot of students, indeed nearly half of the group: two lads from Magdalen, four Americans from Trinity, and me with my long-suffering boyfriend. “I love students; used to be one,” Stuart repeatedly told us, although he also tended to spend a lot of time discussing the horrible ways in which they died, particularly at the hands of the ‘townies’ in the Town-Gown riots. Although much of what was said I had picked up from other students, along with some notable ghost stories Stuart left out, there were several interesting tales which I had never heard before. ‘The Thing’ in Trinity Chapel was discussed for a while, because according to Stuart it wasn’t a mere ghost, but a phantom. 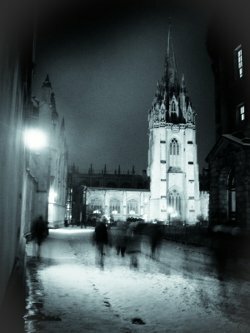 A far more scary phenomenon, apparently, and certainly one that has sent a shiver down the spines of my fellow tourists, who gaze at Trinity chapel in wonder. Stuart could give a ‘chilling’ description of ghosts nonetheless, despite his preference for full-on phantoms (I was never quite sure of his distinction between the two). When discussing one dead tutor at New he states, categorically: “Well, they’re white… with pink eyes.” I thought of Albino rabbits and my current, living tutors. Being on a tour, you suddenly begin to sympathise with both Stuart and the poor tourists. Several times throughout the trip, students would hang around the group giggling, or loudly complain “Ugh, tourists” as we walked by, despite the fact that half of us weren’t tourists at all. Although very well informed, it did seem that our guide was exaggerating at times. “Yes,” he proudly proclaims, “I have seen a ghost. Once I was walking down Deadman’s Walk in Christ Church meadow in the middle of the night, and saw a moving light in Merton’s Old Library. It’s shut at night.” He pauses for dramatic effect, whilst several tourists take a sharp intake of breath. I was suspicious of this, considering that by now it was dark, and Stuart had brought out a tiny red pocket torch, waving it around like a crazed tour guide should. He points it at Merton Library. Considering this was a very cheap torch, only a dim, moving light reflected against the window. I wasn’t impressed, although I seemed to be in the minority as the rest of the group looked on with belief. Stuart also tended to hide any vague answers (which to be fair, were rare) by describing the screams that seemingly resound across Oxford all the time. Referring to the burnings in Broad Street, he finished with: “And you can still hear their screaming today, on this very street, at, erm, three in the morning.” Likewise, all of the dead students from the Town-Gown riots screech by Carfax Tower at two. Scary stuff, although having stumbled around there roughly at that time on a number of occasions myself, I can honestly say I’ve heard nothing more than the frying of the kebab van and then people vomiting it all up. To be honest, this would probably scare the tourists about as much. The tour takes us from Broad Street and into the old part of Oxford. We walk along the Bodleian, past St Mary’s Church and up to Merton College. As we stand in a group that screams “we’re sad tourists” louder than whatever can be heard at Carfax, a group of young men driving past wind down their windows and screech at us. Maybe Stuart was just getting a bit mixed up. Zipping past Examination Schools (for me, the scariest part of the tour) and the Eastgate hotel, we return, by way of Queen’s Lane, to the Bridge of Sighs. Some people, at least, have been ‘spooked’ by the tour. It appears that our guide might have done his job a little too well. Article from The Oxford Student website.